These cars were exhibited alongside their predecessors on Sunday of the Villa d’Este Concorso d’Eleganza weekend for the first-and only-time. This year marks the 100th birthday celebration of famed car company Bugatti. In honor of this prestigious achievement, the auto brand is presenting a slew of special models at events around the world. At the recent Villa d’Este Concorso d’Eleganza, the elite annual event in Italy celebrating historic cars, Bugatti Automobiles S.A.S. 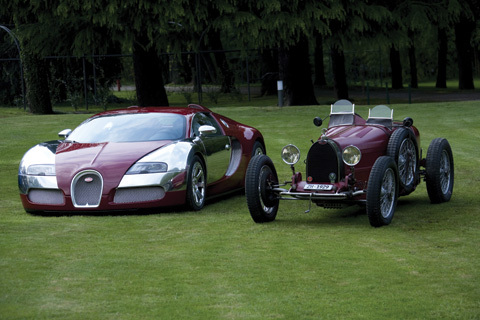 presented four Bugatti Veyron specials-one-off models that are reminders of the company’s glorious history. The four Bugatti Veyron Specials models feature the racing colors of various countries: blue for France, red for Italy, green for England, and white for Germany. Each of the four new Veyrons has a specific predecessor-an original Grand Prix Bugatti on which it was modeled-and each of the unique autos is named after a Bugatti racecar driver from the 1920s and ’30s. These cars were exhibited alongside their predecessors on Sunday of the Villa d’Este Concorso d’Eleganza weekend for the first-and only-time. However, Bugatti will continue its 100-year celebration at the Pebble Beach Concours d’Elegance in California in mid-August, and attendees are guaranteed to be treated to something special from the esteemed brand.